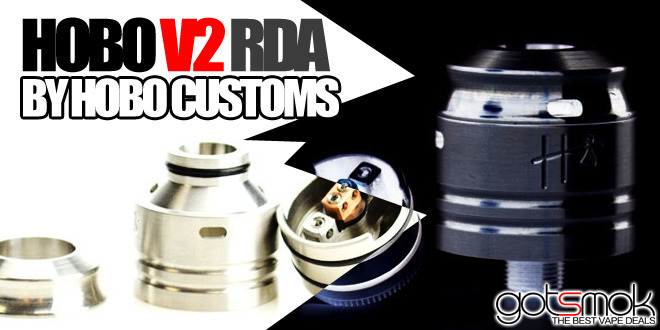 It’s not very often when a RDA atomizer brings something truly new to the table. But, that’s exactly what the Hobo v2 RDA Atomizer by Hobo Customs does. It debuted at ECC. And already VaporDNA has them in stock and ready to ship. It features not 1 but 2 adjustable airflow controls. One from the top of the dripper pointing directly down towards the coils. And, a secondary adjustable airflow control ring that controls the outside airflow holes. Throw in solid copper contacts, PEEK insulators, reduced chamber and a large SEALED juice well (which is removable for easy building). It’s easy to see that the Hobo might be the next BIG atomizer to hit the market.